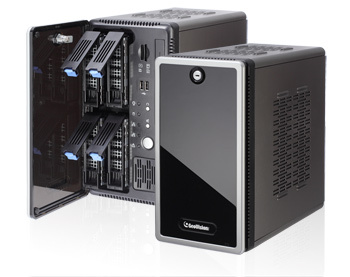 The GV-Tower NVR System comes with 4 hot swap drive bays for the storage up to 16 TB. This system has two CPU options: i3 and i5. The Intel Core i3 processor is based on Sandy Bridge architecture, while the Intel Core i5 processor is based on Ivy Bridge architecture. 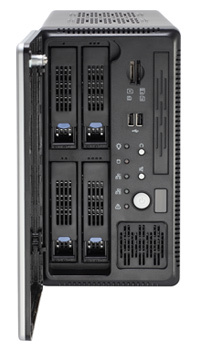 It features the latest upgraded NVR system and 64-bit Microsoft Windows 7. GV-Tower NVR System supports up to 32 channels of GV-IP devices or third-party IP devices (license required). You can also bring the surveillance on the HDTV with a HDMI cable. It is a towering, affordable, and efficient NVR system that you have ever seen. Recovery Automatic system rebuild from internal hard disk. GV-Data Capture V3 Box GV-Data Capture V3 Box can integrate the GV-Tower DVR/NVR System to an electronic POS system, while GV-Data Capture V3E Box can establish such integration through LAN or Internet. GV-Hub V2 An easy way for serial port extension. 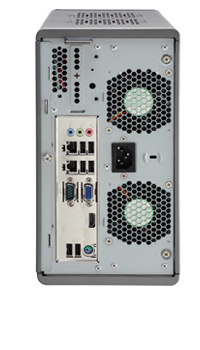 This hub can add 4 RS-232/RS-485 serial ports through the GV-Tower VMS System’s USB port. GV-COM V2 This unit can add 1 RS-232/RS-485 serial port through the GV-Tower VMS System's USB port. GV-Joystick V2 GV-Joystick facilitates the PTZ camera control. It can be either plugged into the GV-Tower VMS System’s for independent use or connected to GV-Keyboard to empower the operation. However, this device can only work on GV-System version 8.2 or later.